Just a quick visit for the Arlington Cemetery in Washington DC is ended up by putting the flag in front of the each tombstone. Remembering the all men and women who died in military Service for the United States. You may find me very patriotic but I would like to touch your feeling and inspire you before writing about fun summer things. Memorial Day is the unofficial beginning of the summer season and for us, it is shortly called barbecue season. Since granite is a natural stone, it is mostly used for backyard granite countertop. It looks very elegant besides being very easy to clean. As a backyard Granite Countertop, Bianco Romano, Astoria, Andromeda, Santa Cecilia Light, Giallo Ornamental, Absolute Black Granites are very popular selections to keep the natural surroundings and the aesthetic inside the home without detracting from the lush green of the outdoor space. Some homeowners would like to break the natural sunbeams on the surface and use the honed granite; others would like to stick on the polished surface. Both polished or honed granite can be used as backyard granite countertop. It is always better to keep the other names of the honed granite in the mind. Every granite company calls the different names of honed surface granite like leather granite and brushed granite. Since your project is outdoor, outdoor kitchen usually love the stainless steel cabinets and teak cabinets. Outdoor flooring is usually natural stones , natural slates to keep the landscape more visible. Patio flooring can be applied for townhouses. 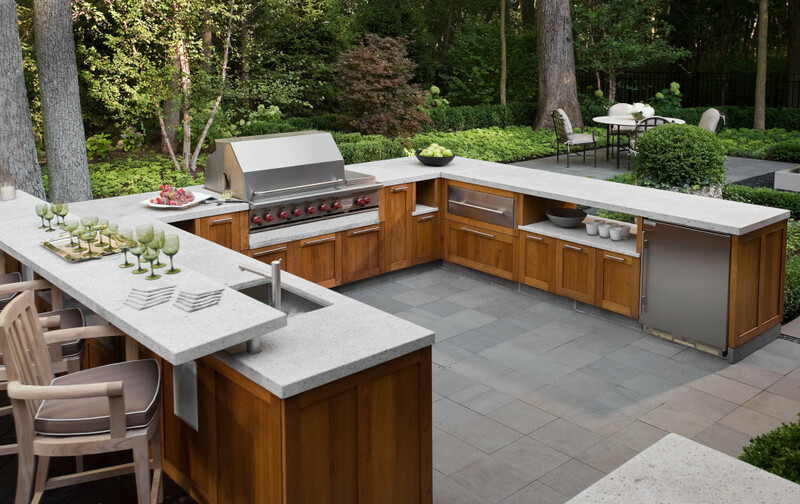 Enjoy having backyard granite countertop and please remember me while you are barbequing. Very easy recipe for boneless skinless chicken tights: Marinate your one pound of chicken tights with the mixture of Italian seasoning and pineapple teriyaki sauce two hours before barbecuing in the refrigerator. For every pound needs 1/4 cup of each ingredient. Do not forget to sip your favorite wine. The inspired backyard granite countertop pictures are picked for your review. Picture Credit: Artistic Stone Kitchen and Bath Inc, Giallo Ornamental Granite Countertop with chisel edge and natural slate built in island. Stainless steel cabinets and stainless steel barbecue are very good choices. It looks very natural and functional. Envying design. Picture Credit:Iron Gate Build and Design Inc., U shaped outdoor kitchen with polished Astoria granite countertop, stainless steel base cabinets, travertine flooring and natural slate counter base. Ergonomic and shady for hot summer days. Stainless steel grill and Brick oven are plus for this elegant backyard. Picture Credit:Fredman Design Group via Houzz, Honed Andormeda Granite in U shape outdoor kitchen completed with marine grade teak cabinets. Breakfast Bar , Stainless steel bbq and cooler bring such a luxury to the peaceful backyard. Picture Credit:Debora Carl Landscape Design., Honed Absolute Black Granite Counterotop with L Shaped stucco counter base and stainless Steel cabinets and appliance. Chilling time would be perfect in this backyard. Picture Credit: Surface One., Giallo Ornamental countertop rocks with natural rock counter base. Such an excellent idea to put the deep frier and barbecue together for the great cooks…. Picture Credit:NYC Fireplaces and Outdoor Kitchens, Santa Cecilia Light Granite Countertop with stainless steel barbecue and stainless steel sink. I shaped outdoor kitchen. Natural slate counter base and natural slate flooring are very epic. Picture Credit: R.E. Hopkins Custom Homes & Foundation Repair., Giallo Ornamental Countertop in corner grill set up. Brick base and Stainless steel appliance. Good to have one into backyard! Please add your valuable comments and share your opinions about your beloved backyard granite countertop.